Here we are at the beginning of a new spotlight, and this is honestly one I’ve wanted to write for a while now. 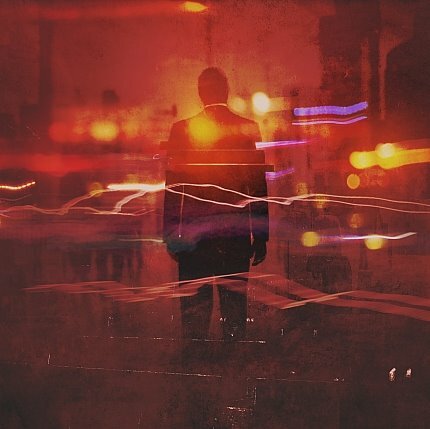 Riverside’s “Anno Domini High Definition” is full of depression and introspection concerning the new modernity; the developing apathy and robotic lives we live within our consumerist society. The album opens with “Hyperactive”, a look at the fast pace of modern society; a pace that never gets us anywhere. “It’s just another day of my life/ In the high res next gen wonderland/ I curse the sun/ Getting out of bed/ I hope my sell-by date/ Didn’t expire yesterday”. As society focuses more and more on economics, technology, and greed; humanity finds itself taking the very planet and universe for granted. Even more than that, the wonders all around us become a nuisance as our priorities are sucked into the black hole of just another day. Just another day? We shift and groan as we trudge through life; never finding any meaning or motivation to make something of ourselves. We are barely even alive. Should someone check to see if we are still breathing? At the same time, our restless lives are constantly in motion as society expects us to keep consuming: to keep devouring everything and creating nothing. Is this the life we were meant to live? Is life meant to be this random and pointless? “Here, you have to run as fast as you can to stay in the same place.” This isn’t right. That isn’t the way things are meant to be. “No matter how much I do for them/ No matter how much I do for myself/ No matter which way I look at it/ Fulfillment passes me by”. Have you felt like you’ve lived your whole life for another person? Have you ever felt empty inside when the whole world is telling you that you should be full? That you are blessed? That you are lucky? I have. “All my life/ I’ve been trying to deny and deceive myself”. Have you ever denied yourself and waited for that “greater reward”, only to end up never seeing it? There’s a point where you have to care for yourself. Sometimes, the best way to help others is to help yourself a bit first. That might sound selfish, but if you don’t allow yourself a little self-maintenance every once in a while, you’ll break down. You’ll drive yourself to destruction. You’ll implode. And, then, the people you love and for who you sacrifice everything will be hurt far more than you might realize. But you feel selfish. You hate your “inner chaos” that makes you fight yourself over your own selfishness. Fulfillment will pass you by, as you can never seize it. You chase the wrong things thinking that material desires can fill that hole inside your heart. Even people can’t fill it. There is an inner peace that can only be realized through communion with your Creator, Jesus Christ, and the reality he has created. This was the case for me, anyways. A real peace. A complete joy. Instead of being driven to destruction, I feel like I am elevated to freedom and spiritual connection. “Once in the middle of the crowd/ I stopped/ Suddenly I felt so good/ Not being on the move”. This third track on Riverside’s “ADHD” was the single they released, and it blew my mind. As I kept listening to it, though, my fascination moved from the music to the lyrics, as I feel very much the same. Rebellion. What is it? We are used to hearing about teens drinking and doing drugs; but, really, isn’t that conforming? Rebellion in this age of fast-paced lives, mass produced everything, and the push to have fun always is, quite simply, slowing down to enjoy life. Stopping to pause and consider life and its meaning is frowned upon by so many crowds today. “But became an obstruction/ In your way/ And I was surprised/ How fast you could unite/ Against me”. In this age of “tolerance”, the only thing that isn’t tolerated is being different. Hedonism, if you didn’t know, is the belief that pleasure is the greatest pursuit and meaning in life. Ego hedonism, then, is the belief that personal pleasure is the greatest meaning in life. Yet, in the never ending race to find pleasure, the world forces us to conform and be just like every one else, as standards of pleasure are set by the masses. Being different, being deep; these things just won’t fly. “In pursuit of uniqueness/ And individuality/ We must be unlike anyone else/ To survive”. So far in “ADHD”, Riverside has given us a picture of modern society in all its obsession, consumerism, and dysfunction. There are two defensive reactions to all of this. On one hand, you might transcend it all. On the other, you might shrink back into a kind of antisocial nothingness. “I used to be one of you/ With the same spark in my eyes/ And now I don’t belong to this place”. Once you see the insincerity of the world in which you live, you must react somehow. And like those with a mental disorder, that reaction is often to shrink back into your own mind for comfort. That’s what the song means by “left out”. “We would have remained ourselves/ Without killing our feelings/ Slowly/ Day by day”. In trying to escape the fraudulent nature of society, we have dreams. We have visions of living away from the din, away from the heartlessness of the zombies all around us. Some escape. Others become their own sort of zombies as they lose all faith, spark, or care. They are truly left out, unnoticed. Lost to reality completely. “Before my fame evaporates/ I must be at the top/ So I control my body/ Mental state/ Unable to slow down”. Hurry. Greed. Gain. More. This is the pulse of modern man. On the final track of “ADHD”, Riverside gives one last opinion. Society tells us that the only point to life is to get more, be more, and have more. Before we die, we must get as much as we can or we will be remembered as a failure. So, with utmost speed, we are supposed to pursue material things and status and acceptance. Any that reject this system are belittled, ravaged, and left out. Indeed, consumerist obsession is the world’s disease. This final track is definitely a restatement of the entire premise of the album. It covers everything, as we see the driving, pounding want and desire that consumes humanity. But it’s more than that. Why do we want so much? Why do we pursue nicer things than everyone else? It’s not necessarily about the wealth: It’s about the status. It’s about being on a pedestal for all to see. We want to be the savior. We want to be the king; to be the hero. Our dysfunctions have convinced us that happiness can only be found in acceptance and accolades from others. In this shallow society, there is no ultimate meaning other than that. How can we be different? How can we disconnect ourselves from the flow all around us? It’s a difficult thought and an even more difficult solution. Perhaps we can beat the system by connecting more with each other, rather than leading our selfish, compartmentalized lives. Perhaps we need more of each other and of the One who connects us all. That’s the start of the solution, anyways.